The MaxiSpan chain is adaptable in design and a top choice for its product cooling capabilities. The innovative MaxiSpan chain is adaptable in design and could cost you less. MaxiSpan utilizes a 75 percent open design. Liquids and debris are able to fall through the chain meaning there is less downtime due to conveyor cleaning. 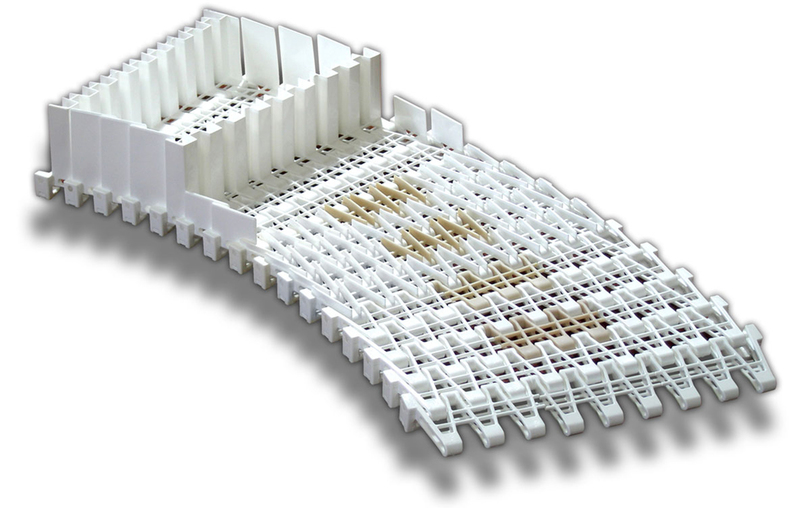 The MaxiSpan’s open design also equals cost savings, due to reduced material use. Horizontal curves, inclines, declines and straight sections are all possible in one continuous conveyor, often eliminating the need for transfers. Plus, the modular design allows for individual sections of the chain to be opened, so service and maintenance are easy. The all-plastic design also makes it a great choice for running through metal detectors.